What a great find: your blog! I see you’ve found my friend Julie’s store (Pomegranates). I’m writing to request permission to use one of your photos for what might seem an odd cause! 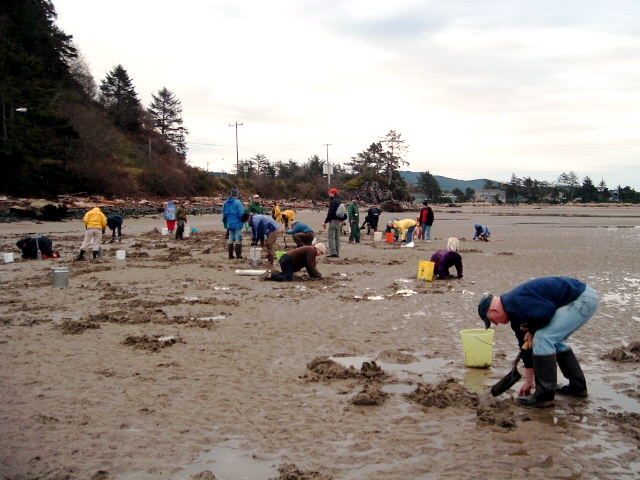 I’m working on a brochure for USF&W on their Alien Aquatic Invaders program, in an effort to stem the tide of invasive species, and the fellow in Portland I’m working with hasn’t been able to supply the images he thought he’d have time to find for me to use. 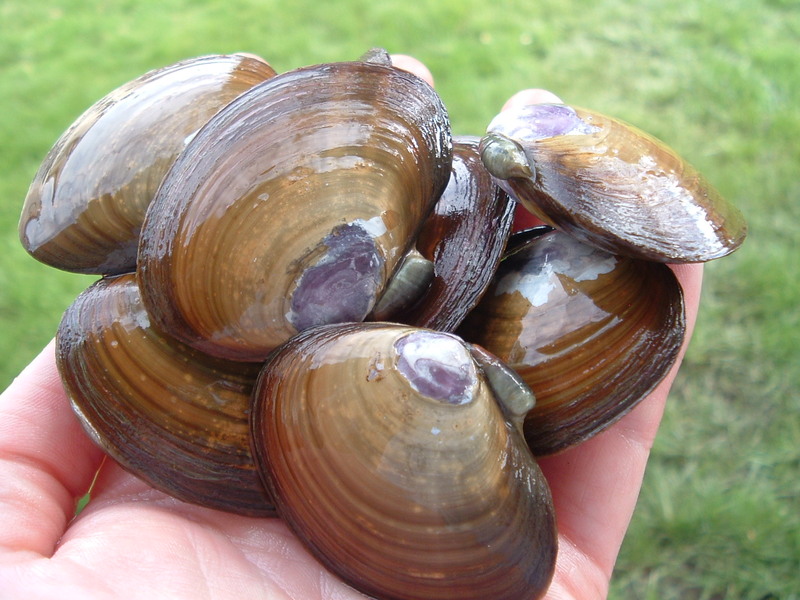 So, I’ve been looking for images of the species he’d like to show and your purple clams are perfect for the brochure. Alas, most likely this panel will be in black and white (maybe color) and I’d like to remove the hands holding them and turn them slightly to fit the format. Might we be granted permission to use them? I’d be happy to meet you to show you what I’ve got in mind, and he might decide not to use them after all, anyway…one never knows! I’m also in Eugene, husband was a UO instructor until he retired a few years ago, we’re birders and are fairly active locally in environmental and bird issues, he writes for the RG (about birds, of course!) and I’ve got several art shows around town, too, in colored pencil… we’re sort of foodies, too, though not like you, and are trying to be gluten-free to stem my asthma, which works when I behave! The brochure will be produced for the public, mostly to be given out at boat ramps and the like, to help impress fisherman, crabbers and clammers, with the importance of paying attention to what they’re seeing, etc.in case new invaders appear. I’m sure we can credit your blog, and many people will see it, so if you’ve got an interest in allowing us to use the image, let me know! Would love to meet you, as I’m inclined to try some of your recipes… or maybe Dan will; he’s the chef in the family now that he retired! Sure, Barbara. Seems like a good cause! I’m away today but will give you a call to discuss details this week. After removing them from their shell, did you cut any of the blackish stuff off like you do for razor clams? My kids and I dug some up yest., but think I’ve gone about the cleaning and cooking all wrong. Hi Heather. No, we didn’t cut anything off. 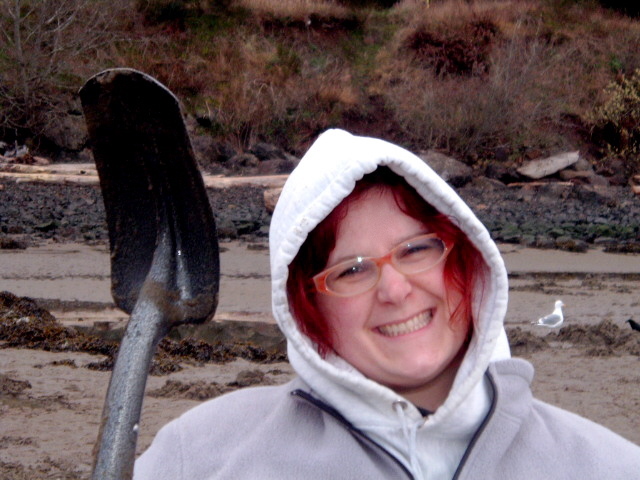 Ours were quite sandy, even after the long soak, so I’d recommend really being careful about soaking them. The teacher of the class recommends letting the clams soak in salt water for 24 hours to purge the sand, and even then he also recommends adding a couple of crushed garlic cloves to encourage the little beasties to spit out the sand! I usually add some fine corn meal (or masa harina) to at least one bucket of my clam water… it helps push sand out of their guts as they filter it from the water. You should soak most hard-shelled clams (i.e., clams with short or no “necks”… pretty much everything except gapers and softshell (mud) clams) for at least 48 hours. 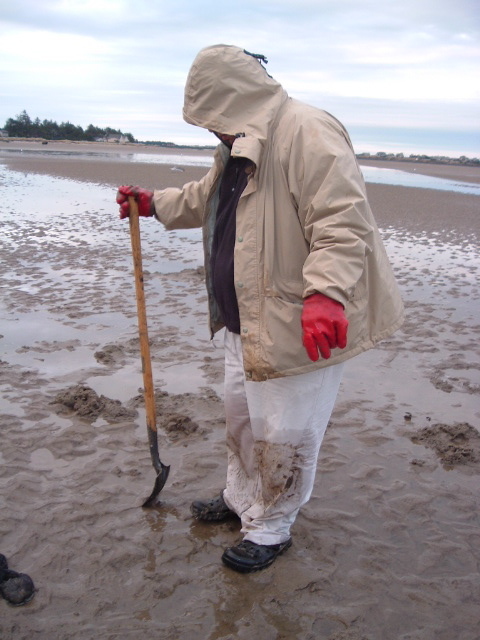 I’ve never dug varnish clams… what does their show look like? After a whole night soaking in Garlic, lots of sand as they are a filter feeder. BUT second batch with corn meal and 24 hours, they were very clean. Oh, if you have alergies to Crab be careful. The larger ones have been found to have the pea crab inside them and if you steam the whole thing like I do you might miss them. They taist GREAT!